Noble cause (dementia care) Michelle but is this, again, electioneering? You say "I have always campaigned for health and social care to be brought closer together". When? I have searched the Web and also tried to find your campaign material for your former prospective constituency, Wentworth and Dearne, without succeeding in finding anything. Your pre-election 'contract' with the people of Wentworth and Dearne has, strangely, disappeared from view. The one thing I managed to glean from the Rotherham Advertiser is the following: "Among the contract pledges are: a promise that she will always live locally, a pledge that she will publish details of her expenses and and assurance that she will hold regular surgeries for constituents. The document echoes the Conservative Party’s National Contract with Britain launched last week, which promises, among other things, to give voters the right to sack MPs, make Government and local council spending more transparent, increase spending on the NHS and increase the state pension." These promises are laughable. Control immigration? Give local communities the power to take charge of the planning system? National debt! In these respects, we could say "the mess left by the last Tory government". Sir, Andrew Lansley’s letter (Apr 5) continues the tradition of British politicians using bluff and bluster. “We want to make the UK a world leader in tackling dementia” — a good start would be to lift the UK from the bottom of the European league table of Alzheimer’s diagnosis, as it was reported to be in national newspapers just one year ago: delays were more than twice as long in Britain as in Italy and Germany, and nine months longer than in Poland. You are certainly correct therefore with your "there is still more to do" but I believe that your "We’ve come a long way in terms of dementia care and research in the past few years" continues the 'tradition' mentioned in the letter. Britain continues to bump along the bottom of European tables in many aspects of health care from stroke and heart attack recovery rates to long-term cancer survival. So who is responsible for our poor health outcomes? As with all aspects of our infrastructure, it is governments who are ultimately responsible. In the 70 years since the war, we have had nine Labour governments with a total of thirty years in power and nine Tory governments with a total of forty years in power. Clearly our system of switching between the two major parties isn't working not just in terms of health care but in many other aspects of national life. We need a new politics of consensus, for the good of the people not the parties, as is practised in continental Europe. And we should start with a fair electoral system. I have 'ranted' on these pages against the Tory candidate for the Chippenham constituency but I live in the North Wiltshire constituency! Why? Because North Wiltshire (formerly Chippenham) has been a safe Tory seat for the best part of 100 years - there is no point in ranting (or voting) here (unless you are a Tory). A postcode lottery of an electoral system is no way to run a country. The word ‘dementia’ has been widely misused for years. Dementia describes a set of symptoms that may include memory loss and difficulties with thinking, problem-solving or language. It is caused when the brain is damaged by disease, such as Alzheimer's disease or a series of strokes. Dementia is progressive, which means the symptoms will gradually get worse. Here are some facts about dementia: CLICK HERE. This afternoon I took the Secretary of State for Health, Jeremy Hunt to meet Wiltshire’s Alzheimer’s Society to discuss what more can be done to support those living with this terrible disease. There are 7000 people with dementia in Wiltshire, 1400 in Chippenham alone. Dementia costs the UK £26.3bn per year, two thirds of the cost of dementia is paid for by those living with the disease and their families. It’s on this final point that the Alzheimer’s Society’s work is so vital. Alzheimer's Society staff and volunteers provide information about local services to people affected by dementia in their communities. From Dementia Cafés and innovative Singing for the Brain sessions to memory-book projects and group outings, their services provide an essential point of human contact. Wiltshire are leaders nationally in the work they do, being one of only a few areas that offer home support. I would like to see more Day Care centres for people living with dementia locally and, if elected as our next MP, I will work with others to help bring that about. I am proud that the Prime Minister has led the world in championing support for those with dementia and I would encourage everyone to join me as a Dementia Friend. We’ve come a long way in terms of dementia care and research in the past few years, but there is still more to do. I have always campaigned for health and social care to be brought closer together to give more joined up care and I am delighted that Jeremy Hunt has made that a clear goal of a future Conservative Government. Today, I heard from the Alzheimer’s Society that this would make a huge difference to those with dementia. Aaah Michelle ... how many more Tory heavyweights are we going to have shipped in to try to wrestle Chippenham away from the Liberal Democrats? “My home is here”. Really, how come? Were you also shipped here by Tory Central Office, in 2013, with the express intention of fighting this marginal seat? “Working damn hard”. Like the miners? Remember them – working damn hard and then thrown on the scrapheap. “I am fed up with politicians trying to trick voters into voting for them with negative campaigning about their opponents. It is desperate stuff, insulting the people’s intelligence. So this is what I am for, rather than what I am against. Hold me to account on it – I won’t let you down. Nationally – why is this area so important? Hard to believe that Michelle has forgotten “what she is for” within one paragraph! Talk about insulting people’s intelligence! And she follows this with another negative paragraph (“Last time …”) about the Lib Dems. Also in this para. is a basic grammatical error (from a university graduate) – “his remaining MP’s” should read “his remaining MPs” – one MP, two or more MPs – this is a plural – no apostrophe Michelle. Any road up (as they would say in Michelle’s former prospective constituency) enough of this pedantry; on to substantive matters. Michelle’s plan for the Chippenham constituency divides into seven principal areas (e.g. More local jobs, Protect our countryside etc) and forty specific targets. Many noble causes no doubt but as with most MPs (no apostrophe) of all shades, this is bluff and bluster, pure electioneering. Forty targets is way beyond any one person’s capacity to deal with substantively. Let’s just deal with one of the targets here – “Re-open Corsham Station”. There is absolutely no point in re-opening stations that would have no services. The only passenger trains on this route are the inter-city HSTs and these certainly would not stop at Corsham. Over many years, MPs and others have, for many reasons, been campaigning (and failing) to initiate an Oxford – Bristol service which would, it is hoped, precipitate the re-opening of Corsham and Wootton Bassett stations. However, thanks to the expensive shambles that is our privatised railway system, there is little rolling stock that could operate this service. A few years ago, after having had to sit in the luggage rack of such a local service from Dorchester to Westbury, I wrote to Mark Hopwood, the managing director of First Great Western, and he responded as follows: “Of course we know crowding still exists, but we are very limited in what more we can do to address the situation, at least within the terms of this franchise. This is because there is simply no more rolling stock available for us to lease. We have quite literally been given everything that there was spare”. There is much material available on the subject but I’ll just quote from Wikipedia here: “The privatization of British Rail led to a hiatus in the ordering of rolling stock, which predictably led to the almost complete collapse of the rolling stock manufacturing industry. When purchases of rolling stock resumed, with little remaining capacity in the UK contracts were increasingly placed overseas”. Interesting isn’t it that with privatisation being heralded as the cure for the supposedly ailing British Rail, HSTs which were designed and built by British Rail Engineering (BREL) at Derby and Crewe, are still, forty years after their introduction into service, providing inter-city services; privatisation has brought nothing better. The ‘British’ BREL, like everything else, was sold off and is now owned by a Canadian company, Bombardier. Similarly, the train operating companies (TOCs) are in the hands of many foreign railway organizations. The twelve franchises listed below are in the hands of the state-owned (ironic isn’t it!) SNCF, Deutsche Bahn and Nederlandse Spoorwegen! Even the royal train is powered by German-owned (Deutsche Bahn) locomotives (also ironic!). The following paragraph (also from Wikipedia) perhaps illustrates the shambles that is our privatised railway system. “The Railways Bill, published in 1993, established a complex structure for the rail industry. British Rail was to be broken up into over 100 separate companies, with most relationships between the successor companies established by contracts, some through regulatory mechanisms (such as the industry-wide network code and the multi-bilateral star model performance regime). Contracts for the use of railway facilities - track, stations and light maintenance depots - must be approved or directed by the Office of Rail Regulation although some facilities are exempt from this requirement. Contracts between the principal passenger train operators and the state are called franchise agreements, and were first established with the Office of Passenger Rail Franchising (OPRAF), then its successor the Strategic Rail Authority and now with the Secretary of State for Transport”. All this time and money wasted in a complex structure of companies and regulators with contracts required between all elements. Franchises being let by the government give little inducement for long-term investment as the bottom-line is short-term profit (or rather reduction of losses) – this is the principal reason that no HST replacements have been introduced – why should a company invest heavily in new rolling stock only to lose its franchise in years to come. The ‘problem’ with British Rail was lack of investment. More money has been pumped into our privatised system by governments than was ever made available to British Rail. What the railways need, and needed, was a long-term strategic vision with associated investment as has happened across the channel with our near neighbours, the French, the Germans and the Dutch. Instead, we have a typically British fragmentation, lacking any long-term, national goal of an integrated transport infrastructure. The Germans, French, Dutch and others have taken advantage of an absurd system created by Michelle’s Tories. Re-open Corsham Station? In the second decade of the 21st-century, First Great Western (aka Worst Great Western or First Great Western Apologises) is not able to provide any more 'cars' because "there is no more rolling stock to lease" for existing services never mind new ones. Anyway, this is a relatively short-term issue compared with the bigger picture of regenerating our rail transport infrastructure. The Corsham Station project could be seen as a cameo in this regard. The re-opening of part of the Waverley Route between Edinburgh and Galashiels and the re-opening of the Portishead line are major taxpayer- or ratepayer-funded infrastructure projects. The Waverley Route (part) has so far cost the taxpayer £50 million but this is, and will be, money well spent for this and future generations with its mitigation of road traffic jams, parking problems and environmental damage in south Edinburgh and other locations along the route. Similarly, the Portishead line is needed for the same, common issues of road traffic jams, lost time, pollution etc. In July 2012, a £1 billion government 'City Deal' was announced which included funding for MetroWest including the Portishead line (note - taxpayers' money). Similarly, in April 2013 North Somerset Council announced that £1.35 million (note - ratepayers' money) had been allocated by four unitary councils towards preparation work for this line. As indicated, these infrastructure projects are, and will be, taxpayer- or ratepayer-funded. There has been no mention of privatisation at this stage. Why? Because a national transport infrastructure requires a national plan; there is no profit in creating infrastructure; as with our road network (apart from certain toll roads) our infrastructure is planned and constructed for the benefit of the nation, the people. Privatisation will only come about when certain people see a profit to be made out of something that has been funded by the taxpayer. This is why privatisation of the railways (and other privatisations e.g. water companies like Wessex Water which is owned by YTL, a Malaysian company) was so wrong. Gordon Brown may have sold off the family gold but the Tories have sold the family silver big-time with our infrastucture now largely in the hands of foreign companies who do not, fundamentally, give a damn about any national plan - they are in it for profit. My challenge to Michelle - get a private company to build Corsham Station. Today, the first batch of postal vote ballot papers are being sent to local people. TOMORROW, voting in the 2015 General Election will begin. Why am I standing for Parliament? My home is here and I am standing to be our next Member of Parliament so that I can represent my neighbours and friends locally. I want to be your MP to challenge those in the Westminster bubble and shake up the system. For too long there has been too small a pool from which MPs are selected. Having never had a ‘job’ in politics, I have always worked for my money in a ‘real’ job, managing a tight household budget. I was the first in my family to finish University. I was taught to work damn hard and make the most of the opportunities that came my way. So, I believe an MP’s job should be to knock down barriers, open doors and create opportunities for all, especially those who need that little bit of extra help. I am fed up with politicians trying to trick voters into voting for them with negative campaigning about their opponents. It is desperate stuff, insulting the people’s intelligence. So this is what I am for, rather than what I am against. Hold me to account on it – I won’t let you down. The national choice is clear. It is between the leadership, security and competence of David Cameron as Prime Minister, or the chaos of Ed Miliband trying to cobble together a group of SNP, Liberal Democrats, Greens or whoever will put him into Downing Street. David Cameron is only 23 constituencies short of forming a majority Government and keeping Ed Miliband out of Downing Street. Ours is one of those 23 constituencies – so how you vote will determine not just our next MP, but our next Prime Minister. Last time Nick Clegg’s Liberal Democrats had no choice but to support David Cameron. This time we don’t know what he will do with his remaining MP’s. They have already shown they would abandon their key election promises like tuition fees to get power. It’s been exposed that they will say or do anything to cling to power. What would they do this time? Once again in this week’s (31st March) newsletter (see below), Michelle repeats “hard-working” and “the economic mess we inherited from Labour”. These mantras became tiresome way before this election campaign but their repetition at every opportunity characterizes a campaign (hers and the Tories) devoid of intelligence and imagination. “ … there were weaknesses in the financial system -- failures of regulation and risk management, excessive leverage and risk-taking -- that were responsible for the ensuing devastation”. “The collapse of Lehman Brothers, a sprawling global bank, in September 2008 almost brought down the world’s financial system. It took huge taxpayer-financed bail-outs to shore up the industry. Even so, the ensuing credit crunch turned what was already a nasty downturn into the worst recession in 80 years. With half a decade’s hindsight, it is clear the crisis had multiple causes. The most obvious is the financiers themselves—especially the irrationally exuberant Anglo-Saxon sort, who claimed to have found a way to banish risk when in fact they had simply lost track of it. Central bankers and other regulators also bear blame, for it was they who tolerated this folly. The whole system was revealed to have been built on flimsy foundations: banks had allowed their balance-sheets to bloat but set aside too little capital to absorb losses. In effect they had bet on themselves with borrowed money, a gamble that had paid off in good times but proved catastrophic in bad”. “Housing was at the centre of the financial train wreck of 2007-08 that has seriously damaged most rich countries. In many countries the effects of that crisis on the wider economy have been large, negative and persistent”. So, as I said, these are just some examples of learned, professional articles on the 2007/8 global financial crash. Nowhere here will you find “an economic mess left by the last Labour government” which is simply absurd, fatuous propaganda and electioneering of a kind that treats the electorate as dimwits. The trouble is that this repetition has been going on for five years and the old saying ‘repeat a lie often enough and it becomes the truth’ comes into play as does (apologies for repeating this!) ‘history, twisted by knaves to make a trap for fools’. Should the Tories be re-elected then the old adage 'Those who cannot remember the past are condemned to repeat it' will, no doubt, come to pass. Interest rates have been kept artificially, politically low for some years; as soon as they start to rise, then we will see another 'sub-prime' (all housing is unaffordable now) housing debt crisis with mortgage defaults, repossessions etc. And at the 2020 election, the mantra will mutate to 'the economic mess inherited from the Tories'. The chart (unknown source unfortunately) shows the year-on-year 'deficit' (the gap between government income and spending) increasing marginally until the financial crash of 2007/8 since which time the gap (yes, thanks to the present government) has been getting back to pre-crash levels. However, the national debt (the total amount the UK owes) has been increasing year-on-year and is forecast to continue increasing (see chart below). Whilst the national deficit has been decreasing since 2010, the national debt (the total amount owed by the UK) has been increasing and is forecast to continue to increase. So let's have a reasoned debate about this Michelle, not mudslinging. We have come a long way since 2010 and the economic mess we inherited from Labour. Now with a growing economy, more jobs, lower taxes and the deficit down we can invest in good schools to help our children reach their potential and a better NHS that will always provide the best care for you and your loved ones. In Chippenham I have been working hard for months, delivering thousands of leaflets, knocking on thousands doors and meeting thousands voters. I have done this because this election is crucial on a national and local level. Yesterday Parliament was dissolved. The Prime Minister went to Buckingham Palace and fired the starting gun for the General Election, his first stop on his campaign bus tour? The Corsham Academy, a great school in this constituency. I am determined to be the local, hardworking and dedicated Member of Parliament that our area needs,with a clear plan for what I want to achieve as our MP. Ours is one of just 23 seats that the Conservatives need to win form a majority government, and keep Ed Miliband out of Downing Street. 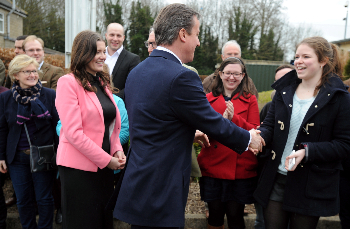 With the Conservatives: David Cameron, strong leadership, a clear economic plan, a better more secure future. Ed Miliband’s Labour Party, propped up by Alex Salmond’s SNP, perhaps Sinn Fein and who knows who else. That would mean chaos for Britain. The choice is clear, competence verses chaos and our constituency is on the front line. I am going to continue to work hard for local residents - there is so much at stake. This election is vital for the future of our country and I look forward to meeting you on the campaign trail in the next few weeks. There’s been another email exchange (27th - 31st March), shown below, with our dear Michelle regarding the Tory mantra “hard working people” … allow me to expand (‘Call me Dave’ has said he would like to see election issues debated so I’ll take him up on the offer). In the 1980s a significant shift from the public sector provision of elderly care to private sector homes occurred, with the proportion of private facilities increasing from just 18% in 1980 to 85% by the end of the century (from Wikipedia). This shift illustrates the success of the Tory privatisation doctrine (I will perhaps start on the railways, my pet subject, later). Prior to 1980, most care homes were run by local authorities. They were well-run, staff were well-paid and motivated (we have 20-years worth of experience in this household). Privatisation and its required profit have seen staff paid the minimum wage for all shifts whether it be night or weekend (including Sunday) – so £6.50 per hour for working a Saturday/Sunday night shift! As I have said in a previous article, this level of pay is not a living wage so workers are forced to claim benefits funded by the taxpayer. Taxpayer subsidy of low-paid workers allows company bosses and investors in those companies to reap richer rewards (this is the Tory aesthetic, or ethic, isn’t it – the rich becoming richer and the poor poorer?). Take investment company IQ whose website ‘headline’ is “Creating wealth through knowledge and secure investments” and later “Why invest in the care home industry?”. Apparently “Banks and lending institutions are becoming very eager to lend within this industry due to the long term, robust and lower risk income streams that it offers”. Delighted clients state “In IQ I feel I have found a company who I believe has my best interests at heart” and “in-depth knowledge of the local area and ability to understand exactly what we wanted made the buying process so simple”. This is the privatised world – the “best interests” of investors while taxpayers support low-paid staff and the aged have to suffer the consequences. Yet it needn't be this way. Whilst the performance of the French economy is currently being derided, it is still larger (and companies more successful) than the UK's economy. This is in spite of its Code du Travail (employers regulations regarding workers) weighing in at more than 2kg. Look how many successful (publicly-owned in some cases) French companies operate here in the UK - Alcatel, Alstom, Astrium (in Corsham! ), ATOS (running our disability claims system! ), AXA, EDF, Lafarge (cement), Sodexo (services including works canteens), SNCF, Thales (defence, aerospace, transport - offices in Reading) and so on. In France with its highly-regulated companies, 57 per cent of institutional care facilities are public facilities, about 27 per cent are private not-for-profit facilities and around 16 per cent are private for-profit facilities. Rather than deriding the French way, I think we should more use it as a model. Thanks for the response, however my concern about your use of the phrase "hard working people" is particularly that it comes straight from the Tory School of Propaganda. It is no more than a slogan (like The Big Society) drilled into every Tory and is, and always was, meaningless. And when you say "our local area", how long have you lived here? My response to this could be: "how dare you appear on the scene, from Yorkshire or Cheshire or wherever, through the diktat of Tory Central Office, and proceed to tell us what you propose to do in 'our' area". By the way, I see you are from Whitley, Cheshire. This is where my great uncle Tom (Lightfoot) lived. My mother recalled journeying there, in the 20s and 30s from her home in Lower Walton, by pony and trap. You may wonder (but you probably don't) why I have an ongoing dialogue with the prospective Tory candidate for the Chippenham constituency on these pages. Well, for one thing, I just happen to be on her mailing list. But the other reason is that the North Wiltshire constituency (currently and in its former life when it was Chippenham) has been Tory since the collapse of the Liberal vote (and the party) in the 1920s. So there is no point in dialogue here; in fact there is no point in trotting off to the polling station here. I must be barmy - I have voted in every election since 1964 (thirteen general elections I believe) and my vote has never counted towards anything. With our postcode lottery, first-past-the-post system, voting in safe seats (unless you vote for the 'sitting' party) is an absolutely futile exercise - 50 years of worthless voting in my case. Anyway I should, perhaps, have been more expansive in my response to Michelle Donelan’s latest, 20th March 2015, email. Thatcher’s monetarist policy of reducing inflation and its corollary of high unemployment, which rose from 1.4 million in 1979 to 3.2 million in 1984, was the seedbed of our supposed benefits ‘culture’ which has been so derided by the present government. In 1986 deregulation of financial markets, the Big Bang, was the seedbed of the creation of financial ‘instruments’ to make money through, for example, packaging debt, derivatives (whatever they may be), futures – all sorts of exotic, imprudent methods of investment gambling. The complexity of this imprudence was bound to end in tears and it did, after American (subprime) mortgage debt effectively precipitated the 2007 financial crash (and none of our high-paid, expert City executives whose inflated salaries are necessary to attract the “best” people, saw it coming) . The lending of money, in the US, to those that couldn’t afford repayments had been reflected in the UK since the 80s. Maxed out on your credit card? We’ll increase your spending limit. Or another bank will give you new card without compunction. When I worked in Belgium, I had a credit card with a Belgian bank. The monthly limit was 2,500 euro and the total amount spent in month A was automatically taken from my bank account in month B – so no possibility of accumulating debt. Contrast the UK where banks positively encouraged people to accumulate debt – the result of deregulation, demutualisations and imprudence. 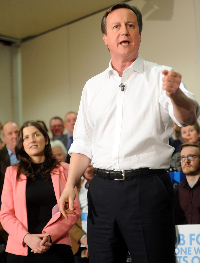 And who had to bail out the high-rolling, irresponsible, deregulated bankers – you did, my dear taxpaying reader. And the b******s (there’s six stars there!) still take their bonuses. A property-owning democracy – bloomin’ marvellous. However, speculators or buy-to-rent, millionaire (or multi-millionaire) landlords now own a substantial percentage of ex-council property. It was first revealed by Danny Dorling (geography professor at Oxford) in his 2013 book All that is Solid that Charles Gow, the son of Ian Gow, Thatcher’s minister who presided over the Right to Buy scheme, is a housing tycoon, owning more than forty (perhaps ninety-three according to another source) ex-council flats in one London estate alone. A report published in January 2013 by London Assembly member Tom Copley, From Right to Buy to Buy to Let,showed that 36% of homes sold under Right to Buy in London (52,000 homes!) were in the hands of under-regulated, private landlords. So the Right to Buy scheme has resulted in multi-millionaire private landlords renting ex-council properties (often through councils) to tenants, many of whom are on housing benefit subsidised by the taxpayer! Get the picture? The great council house sell-off has culminated in the rich taking advantage and you, my dear taxpaying reader, subsidising the rents of their tenants. The seedbed of today’s supposed housing crisis. The mantras “hard working people”, “the mess left by the last government” and so on have been programmed at Tory madrassas and trumpeted by their mouthpieces for five years – history, twisted by knaves to make a trap for fools (thanks Rudyard)! I recall that Mrs Thatcher rewarded the miners and others who had "worked hard" by throwing them and their communities on the scrapheap. This was Thatcher's mechanism for inflation control - a deliberate increase in unemployment from around one million to around three million. The community that once was Dinnington in South Yorkshire (not far from your first prospective constituency) was where my grandfather worked as a miner. On our 2011 visit, his old house in what must have been a charming street in the old days, with all houses having gabled windows and porches, was, along with all the others, a shadow of its former self. The 'community' had long gone with no alternative, other than unemployment, offered. I'm sick and tired of your mantra 'hard working people' - why don't you revisit a mantra from the early days of the current government - 'The Big Society' - whatever happened to that? One of my key commitments to our community is ensuring that local people have security in retirement. Ensure Britain has a strong economy, so we can protect the NHS and make sure no-one is forced to sell their home to pay for care. Extend new pension freedoms to the 5 million pensioners who already have an annuity – meaning pensioners will be able to sell their annuity income in return for a lump sum. The commitments that the Prime Minister has made to those in retirement are crucial and have been widely welcomed in Wiltshire. Other parties have different views, but I am pleased that those who have worked hard and paid into the system all their lives are being supported in their retirement by David Cameron’s commitments. Do you have any views on this, or any other, manifesto commitment? Let me know onmichelle@michelledonelan.com. Your opening paragraph is an oxymoron. Strong (local) public services are and should be funded through substantive taxes. I lived in Belgium for twenty years where the extremely effective public services were funded, in part, through a robust taxation system. I could travel the 6 km to my local town on the bus for the equivalent of 65 pence - at that time (and now) an equivalent journey in the UK would be five times more. Similarly, for my journeys to and from England via Eurostar, the Belgium leg of the journey was free (yes free, from any departure point in Belgium). These publicly-funded schemes encouraged the use of public transport and, of course, the knock-on effect was to reduce congestion, pollution, environmental damage etc. Another example of robust public services was/is the Belgium health system (which is topped up by company and private insurance schemes). I have a heart condition and saw a consultant regularly in the local hospital where my check-up which included ECG, ultra-sound, blood-pressure checks and consultation cost about 120 euro - the equivalent, at the time, of about £85 (affordable!). On my return to the UK, I arranged a 'private' consultation through the Bath Clinic (but using RUH services) for a similar check-up. The cost? More than £600 (unaffordable)! Much of this money was diverted to the 'private' sector. Your "working hard for your family" is purely oft-repeated hyperbole and propaganda heard so much in recent years in an effort to brainwash the public into believing that this government is on the side of "hard working" people. My niece, aged 40, works hard, very hard, in a care home. She works nights. Her wage? The minimum wage - £6.50 per hour. Because employers can get away with paying minimum wages (due in part to high levels of immigration - if you don't do the job, others, used to lower wages, will), incomes have to be topped up through the benefits system and tax credit system funded by ... guess who - the taxpayer. So the taxpayer is topping up the wages of workers while company bosses reap ever higher profits. Any wonder that there has been so much in the press about the rich getting richer and the poor poorer particularly since the 2008 financial crash. The point here is that it doesn't matter how much or how little you propose to cut taxes - people are not being paid a living wage. So rudloescene (see below) believes that the minimum wage should be £10 per hour - £120 for a 12-hour night shift is surely reasonable whereas £78 for the same shift is not. And £10 per hour for a 40-hour week garners just £400 - even then, not really a living wage. In addition there should be a maximum wage, probably around the £200,000 mark - after all the prime minister, with all his responsibilities, receives only £165,000 (right?). I believe in taxes that are as low as possible for everyone but generate the revenue we need to fund strong, local public services. If I am fortunate enough to be our next MP after May 7th, I will strongly support cuts to income tax for thousands of local residents, keeping more money in our local economy for us to spend in our town centres. If you're working hard to provide for your family, you should keep more of the money you earn. I’m pleased that George Osborne has cut income tax every year since 2010 - I am committed to keep on cutting income tax for Wiltshire residents after the next election.